Its very rare that I invest in a Saree, but when I do, I make sure that it would not end up as a behind a closet piece, but I should be able to bring more versatility and value to the whole 9 yards and wear it more often . 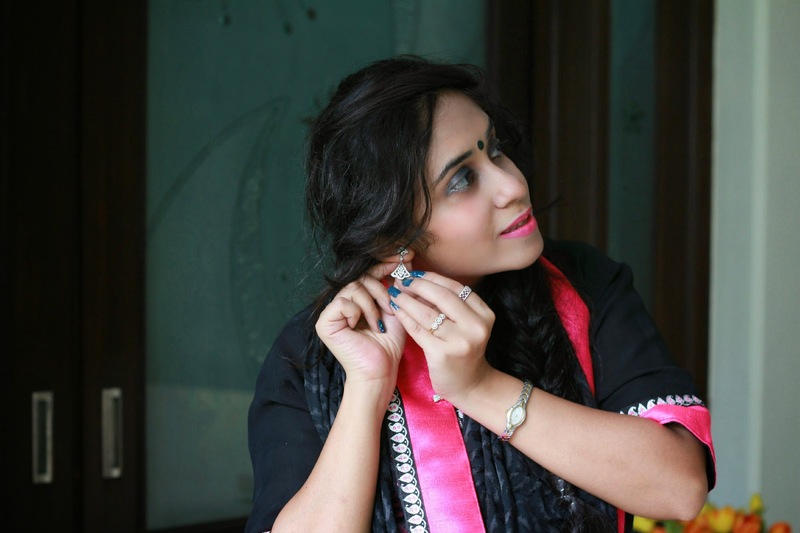 Recently I was introduced to Triveni Sarees. 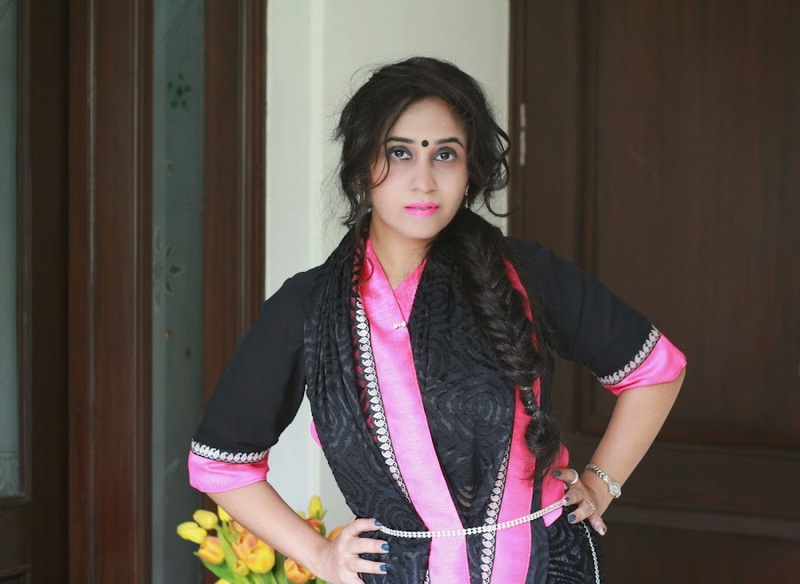 If you want to replicate any Indian Celebrity style ethnic look, chances are that not only you would be spoilt for choices , but also might get addicted surfing through and thorough and get hooked on ! They have some beautiful Indian wear from sarees, to lehengas and kurtis and some pretty matching accessories to go with too. 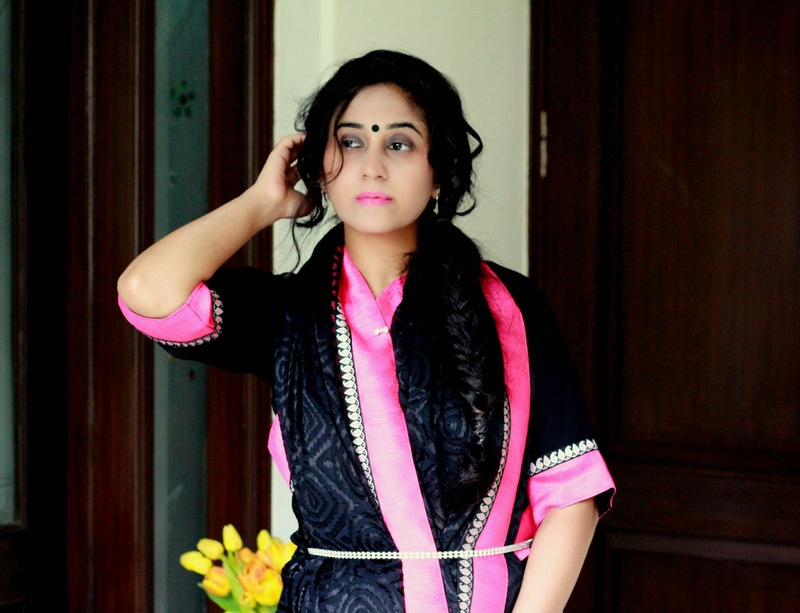 If you are looking for some Indian fusion pieces , then you may not search further, since there are a whole lot of designers and their grooves and even the best of runway styles ready to be served on the platter. The prices are pocket -friendly and all the sarees comes with an option of getting them pre-stitched and add-ons likes underskirts, Blouse stitching, finishing etc. 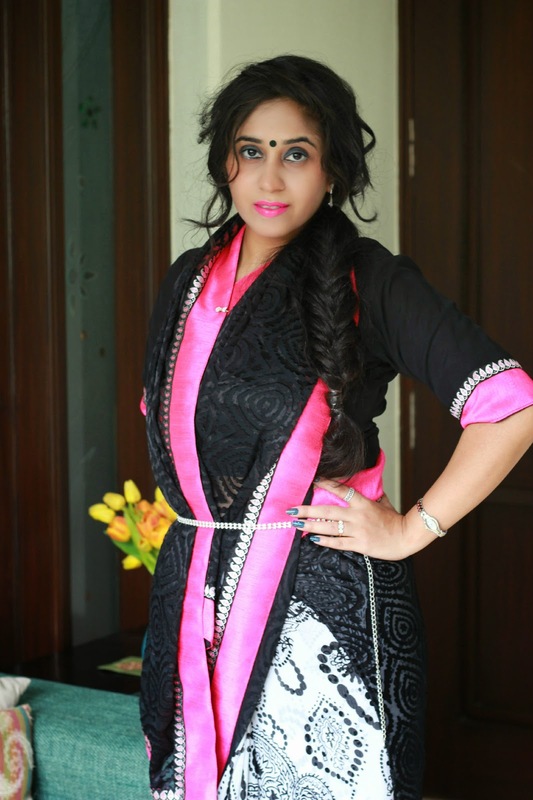 I love the contrast of this pink border on this black and white saree,a combo which was on my list for a while. The saree looks way better than what was in the website, and I love the fact that its extremely light weight and elegant. Today's women like to experiment, and is fearless , hence , when I saw Shruti hassan's Harper's Bazar cover shoot, where she is wearing Rahul Mishra I decided to let go of traditional drape and use her as my style inspiration for this post and added a cummerbund to add a touch of eccentricity.A small pin brooch for a sleek and modern touch , and we are talking an Outfit . Loved everything about the look...! Hi! Beautiful makeup and I like your traditional dress. Love it & thanks for stopping by! 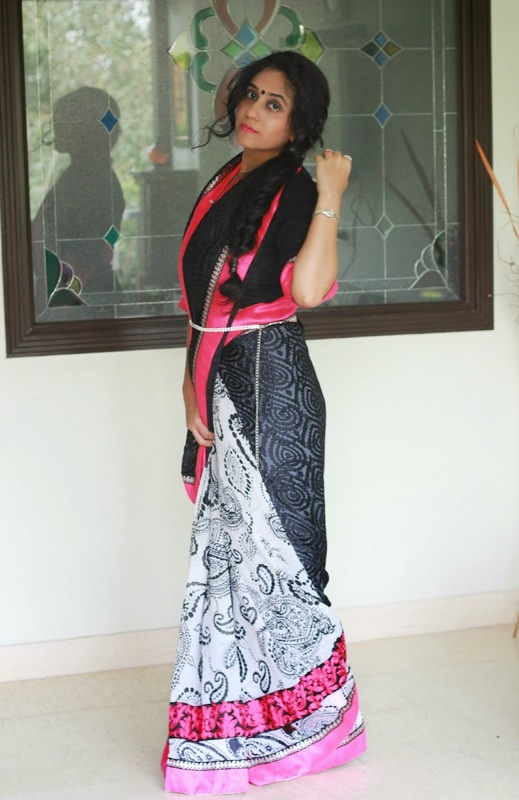 Oh my, you look stunning in this saree! Love your photos! Would you like to follow each other on GFC & Bloglovin? Please let me know. beautiful saree. love the shade of lipstick too. which one is it?? That saree is a steal! You look heavenly. You look amazing... and thank you so much for your lovely thoughts on my past post!! Wow, this looks just absolutely amazing! This is my favorite combination too!!! And as I told you before, am totally loving the styling!! <3"
Would have been just perfect if the blouse was stitched in your size! You look gorgeous! I have always loved the patterns and brilliant colors of saris.